In the field of project management, we talk quite a bit about productivity. One easy way to track the time left until a project’s completion is with Timescale. 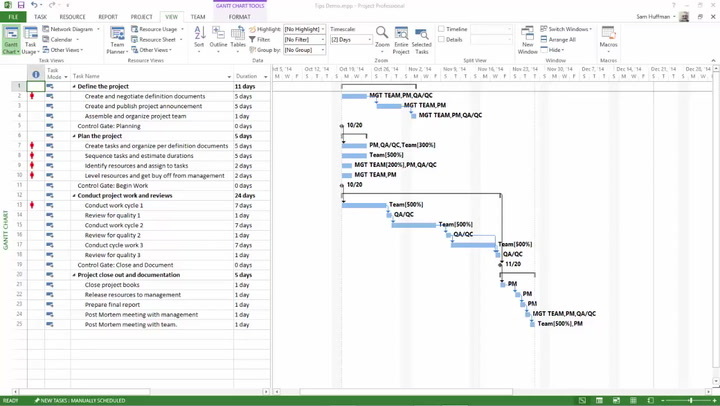 Timescale displayed in Gantt Chart (Bar Chart) has two tiers – the starting date of the week on the top, and the week day label on the bottom. The week day label is highlighted below. Step 1: Double click the Timescale or right click the Timescale and choose Timescale. Step 2: Select Middle Tier tab. Step 3: In Units drop down select Days and in Label drop down select 4,3, 2, 1, … (From End). Step 4: Change Show: drop down to One Tier (Middle). You will now notice the Timescale displays the remaining days to complete the work. B Sai Prasad, PMP®, PMI-SP®, MVP Project, Senior Manager – Learning & Development, has been with service provider Cognizant Technology Solutions India Pvt. Ltd since 2001 where he was named winner of the company’s Global Trainer of the Year award. He has spent 13,000-plus hours in mentoring, coaching, training 9000-plus practitioners on project management topics ranging from project management concepts, project risk management, project scheduling, Microsoft Office Project® to software estimation techniques. He is a Champion of Project Management from PMI India and also Associate Champion Advisory Committee, PMI India. He is awarded the Champion of the Quarter (Q4 – 2012) and Delivery Excellence Award (2011-2012, 2012-2013) from PMI India. He’s also the editor of the project management book, Forecast Scheduling with Project 2010. He is a Microsoft Certified Technology Specialist (MCTS) in Project 2010. He is the President of the MPUG India Chennai chapter to promote and help practitioners on how to effectively use Microsoft Office Project.